“That’s my plane,” beamed a proud John D. Idol, chairman and chief executive officer of Michael Kors Holdings Ltd., as he glanced over at the private jet he loaned to his company for its “Jet Set Experience” event set at Hongqiao International Airport. The parked jet was the first thing attendees saw when they entered the venue, a private hangar at the airport. 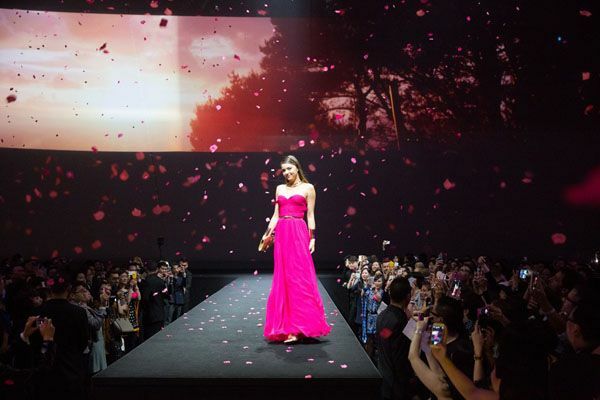 Guests who included Hilary Swank, Freida Pinto, Camilla Belle, Silas Chou, Ming Xi, Hu Bing, Gao Yuanyuan and fashion designer Uma Wang proceeded to take in a runway show of one-off pieces Kors created for the occasion to illustrate the jet-set lifestyle. The collection covered everything from sleek evening dresses to swimwear and fur-trimmed mountain resortwear. Along the way, large-scale video projections set the scene for each locale and provided an aerial view of each model’s walk down the runway. Shanghai-based Wang, who worked with Kors as part of a Council of Fashion Designers of America exchange program, said she was excited to see her “old friend” and she is working on her own company. “For my brand, I’m just following the seasons, I have no real plan. We want to stay boutique, so no plans to open stores in other places,” she said.